The Red Apple Rest in March 2013, seven years after the place was abandoned. The building is now fenced off. The Red Apple Rest had much business during the 1940s and 1950s. 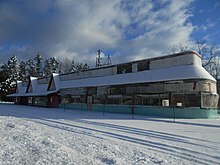 It was open 365 days a year, 24 hours a day, and was patronized by so-called "Borscht Belt" comedians and professional athletes as well as families traveling to campgrounds and resorts. Although the Thruway (which was built beginning 1953) bypassed the restaurant, and vacationing in the Catskill Mountains became less popular after the 1960s, the restaurant remained very busy until the 1970s. In 1965 the Red Apple Rest served one million customers. In his book on Jewish comedians in America, The Haunted Smile, author Lawrence J. Epstein said that comedians would stop at the Red Apple Rest late at night and "would go over the acts, describe the audience, and gather gossip about the other comedians and about routines ripe for buying or 'borrowing.'" The Red Apple Motel, which is sited on the hill to the west of the restaurant, was used by performers late into the 1970s. Several Rock and Roll musicians stayed during their bookings in New York City. The location was secluded and the staff was either 'cool about it' or uninformed. Many well known performers roamed through nearby Sterling Forest while waiting to travel to their nighttime venues. One hotel guest that can be named now is George Carlin, who stayed in room 102 during his Saturday Night Live opening week. He required silence during the morning hours to allow for rest, but was very active with the staff during the night. It was common for him to trial material with the night shift desk clerk. After 53 years under the Freed family management, the Red Apple Rest was sold in 1984 to a Greek businessman who ran it for another 21 years. At that point it was mostly catering to locals due to the fact that the Catskills had dwindled away as a destination. It closed in September 2006—purportedly for various reasons. The restaurant was featured in several movies such as Woody Allen's Deconstructing Harry, A Walk on the Moon, Tenderness and Oliver's Story, and the November 28, 2013 installment of Bill Griffith's Zippy. On August 25, 2011 the Times Herald-Record ran an article about the town of Tuxedo and a group of British entrepreneurs looking to find a location for a new Ace Eatery. Inspired by a YouTube video, the Red Apple Rest was nominated as a potential place to open a new-eatery meant for bikers. Tuxedo town supervisor Peter Dolan mentioned that about 17,000 bikes go through Tuxedo during the summer. However, the building also needed major renovation work and was up against many other possible locations. If the Red Apple Rest had been chosen, the new restaurant would have opened in 2012. Founder Reuben Freed's youngest daughter, Elaine Freed Lindenblatt, published Stop at the Red Apple (SUNY Press, 2014), a memoir chronicling the 50+-year history of the original Red Apple Rest in its heyday and beyond. ^ a b Al-Rikabi, Ramsey (2007-02-08). "Tuxedo's Landmark Red Apple Rest condemned". Times Herald-Record. Retrieved 2008-07-21. ^ Berger, Joseph (1999-08-30). "Empty Tables and Full Memories; Lines Are Gone at Fabled Cafeteria on Way to Catskills". The New York Times. Retrieved 2008-07-21. ^ a b c d Sullivan, John (2009-07-27). "Tuxedo Historical Society invites memories, memorabilia from Red Apple Rest". Times Herald Record. Retrieved 2009-07-27. ^ Epstein, Lawrence. The Haunted Smile: The Story of Jewish Comedians in America. PublicAffairs. p. 114. ISBN 978-1-58648-162-9. ^ Griffith, Bill. "It Came From Frank Lloyd Wright," Zippy (comic strip), Thursday November 28, 2013. ^ Sunkin, Alyssa (August 25, 2011). "Suitors for famed Red Apple Rest?". Times Herald-Record. Albany, New York. Retrieved October 7, 2011.